Kodak super 8 film history. The story of practical “home movies” began in 1923. Although 35mm film had been the standard for theatrical releases for decades, the large film was cumbersome, expensive, and dangerous due to its flammable nature. For years, the Eastman Kodak Company had worked to develop a system of movie equipment and film that would be easy enough for the advanced amateur photographer to use, yet reasonably affordable. The result was the Sixteen Millimeter “Cine Kodak” Camera and the Kodascope Projector”. The camera itself weighed about seven pounds, and had to be handcranked at two turns per second during filming. A tripod was included in the package, all of which cost a whopping $335.00! And this in a time when a new Ford automobile could be purchased for $550.00. Thus, Home Movie Making was not an inexpensive hobby, but one that was capable of exciting, high-quality results. By 1932, with America in the throes of the Great Depression, a new format, the “Cine Kodak Eight”, was introduced. 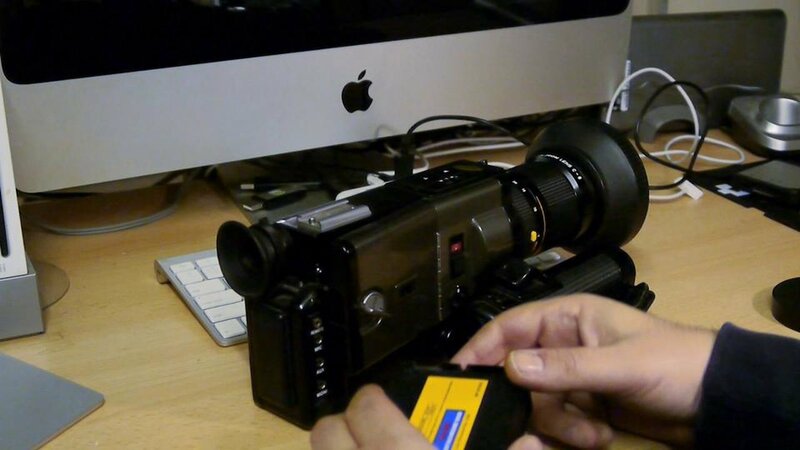 Utilizing a special 16mm film which had double the number of perforations on both sides, the film maker would run the film through the camera in one direction, then reload and expose the other side of the film, the way an audio cassette is used today. Since the 8 mm frame was one-quarter the size of “sixteen”, this method reduced by a factor of four the amount of film necessary to give the same running time – four minutes – as a standard one-hundred-foot length of 16 mm stock. After development, the laboratory would slit the film lengthwise down the center, and splice one end to the other, yielding fifty feet of finished 8 mm movies. The success of 8mm film was almost immediate, and within about fifteen years, 16 mm film became almost exclusively a format of the professional filmmaker. By the 1950’s, 8 mm home movie cameras were a common sight at family parties, special events and on vacations. In the 1960’s, research began on an improved system of home movie products that would also have potential use in Audio-Visual Applications. Eastman scientists sought to further simplify the movie-making process while improving the quality of the pictures. Scientists were asked to create this new product unencumbered by existing technology. Rather, some of the best features from previous formats would be considered. Cartridge loading eliminated the threading of the film.No flipping of the film load was required; the entire 50-foot cartridge could be shot without interruption. Rather than manufacture both a “Daylight” and a “Type-A” (Tungsten) form of the new film, each Super 8 Camera would have a built-in filter, making it possible to make only the “Type A”” product, which could be used in either kind of light. The perforations (sprocket holes) were reduced in size, allowing for a wider image area that was about 50% larger than standard 8mm film. Maximizing the film width was a concept that originated in France by Pathe, with their 9.5mm camera system. The perforations were also moved to a point adjacent to the center of the film frame, making steady registration simpler. 16mm and standard 8mm formats had placed the perforation at the corners of the frame to reduce fogging of the image at the head and tail of the roll caused during loading of the film. Since Super 8 was a cartridge-loaded product, this was no longer an issue. Virtually all Super 8 Cameras would have built-in light meters, a feature dating back to the early 1950’s in 16mm and 1960 in 8mm cameras. In April of 1965, this revolutionary new format was introduced, and while the marketplace has changed in the past thirty years, new generations of filmmakers with film projects and applications which were non-existent in the 1960’s have come to embrace the small film. Many of today’s great cinematographers and directors began their careers decades ago, at the counter of their local photo shop, buying a cartridge of Super 8 film.